At the Celebration of the Arts, from dawn to midnight. 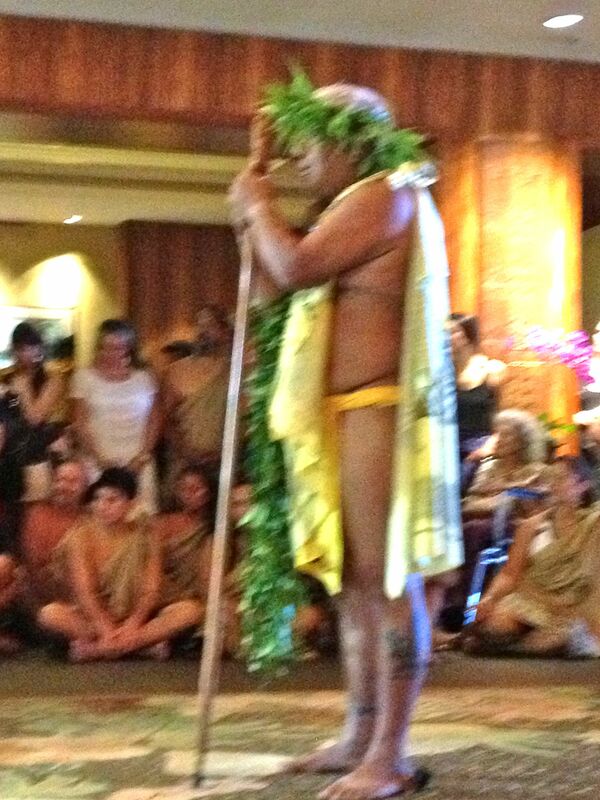 First, a cleansing ceremony in the ocean at sunrise (did not go this year), later opening ceremonies in the lobby of the Ritz Carlton Kapalua, informative talks including one on Hawaiian adornments (shown), the luau show (shown), after hours entertainment with a friend greeting a friend. Blogger focused on learning and not photographing or there would have been much moe. Thinking of posting a couple You tube videos when there is time. Mahalo Ritz Carlton Kapalua for my enjoyable 10th year at the festival photographing and taking notes. Watch for a Lahaina News column in the next month containing nuggets of new insights on the culture. Previous HOW CAN AN AUTHOR HAVE A FUN WEEKEND ON MAUI? Next WHAT SPECIAL PERFORMERS CELEBRATED A SIGNIFICANT EVENT ON MAUI?